It’s time to change mental health perceptions in the workplace. 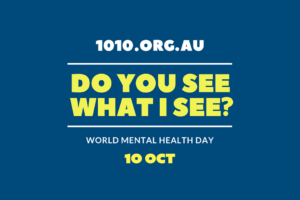 Today is World Mental Health Day, and this year’s theme ‘Do you see what I see?’ aims to challenge the perceptions about mental illness around the world. With one in five Australian’s living with mental health conditions, it’s time we start looking at mental health in a more positive light. One place we must start to look at changing perception is in the workplace. We encourage reform in the workplace through strategic intervention programs, the better we will position ourselves to help, support and build a more compassionate and healthy workforce in Australia. According to Mental Health Australia’s Investing to Save report, investing in workplace initiatives could save Australia more than $4.5 billion in lost productivity. The Commonwealth is committing $338 million into the mental health sector in the 2018 -19 Budget, which is a generous step in the right direction. We partner with ON-Q Disability Employment Services and NDIS support who work alongside many people who live with mental health challenges daily, and join them on their transformation journey as they transition into paid employment and find a sense purpose, confidence and fulfilment. The World Health Organisation (WHO) is also encouraging us to help our younger generation. We work with a lot of younger job seekers looking for apprenticeships and traineeships, so it’s important to us that we do more than help job seekers acquire employment – we also want to help them retain and successfully gain their qualification. One way we can do this is offer mentoring support to both employee and employer providing resources that can help open up dialogue, provide guidance or give them tools to help manage their situation. The services are at no cost to either employer or employee. If you feel that you or your employee could benefit from these services, get in contact with us. For employers, it’s crucial to develop tools to help and support a healthy workplace for not only productivity but also workplace culture. An action plan will help to identify areas that relate to workplace health and provide a list of actions to be taken based on needs. Heads Up offer a free tool to help employers create a workplace mental health action plan. Understanding mental health is one piece to a very large puzzle, but there are things we can do collectively to educate, train and dispel the stigma attached to mental health in the workplace. We need to take an intervention approach through education and training, and while it may not be easy, it is essential because health and wellbeing is everyone’s business. Fostering a culture of openness and understanding, within your organisation, will help to build resilience and start changing the perspective on mental health.